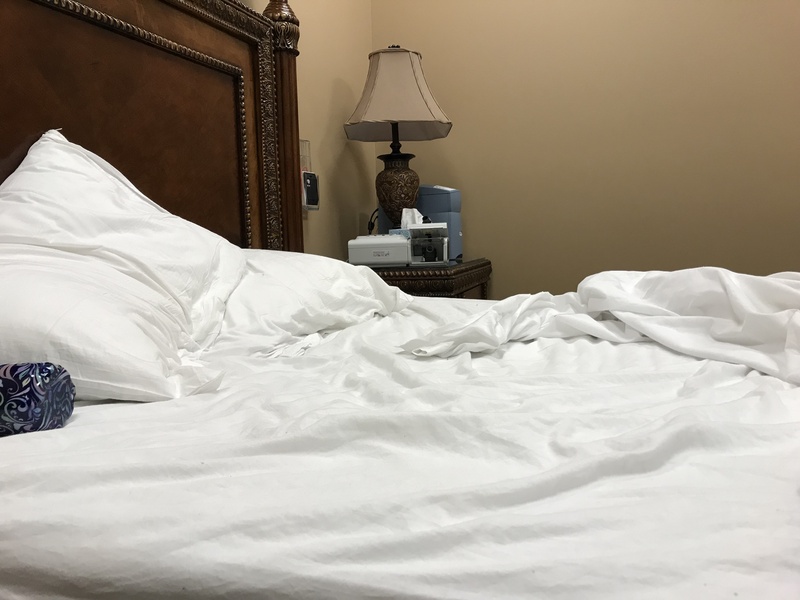 I met with the sleep doctor and after reviewing the general synopsis of my medical history (she only had fifteen minutes, not five hours), she ordered two sleep studies for me—one overnight, and one consisting of five naps during the day. She also put me on a new sleep schedule. She agreed that my body does not want to sleep at night like a normal person—it just doesn’t. But we could try dialing it back a little. She wanted me to stop falling asleep to music or TV shows and have everything quiet, lights out, at 2 AM and to wake up at 10 AM. 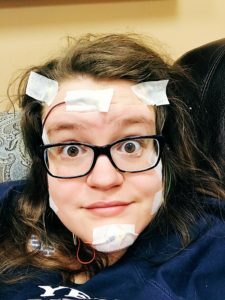 I dreaded the sleep study for many reasons—I don’t like wires hooked up to me, I don’t like sleeping away from my bed… and I tried to think of reasons to cancel it. But I manned up and showed up for it. 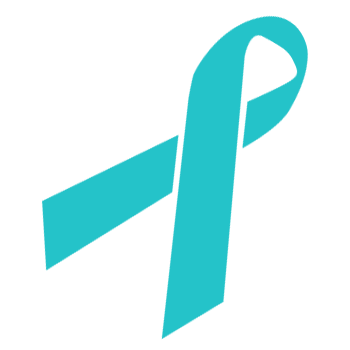 I have no doubt in the world that people have had good experiences with sleep studies—but mine, along with most medical tests, was a thumbs down. And here’s my breakdown of how it went. 8:45 PM — I arrived, already dressed in pajamas, ready for my sleep study. They welcomed me into my room, a windowless bedroom with a large memory foam mattress, arm chair, and television. 9 PM — The tech had me sit in a chair while she started attaching hooking me up to dozens of wires that all plugged into a little panel (that would later plug into the wall.) She used the stickiest paste known to mankind to attach the electrodes—I’d occasionally get it on my fingers and the only thing that removed it was hand sanitizer and humble pleading with a higher power. 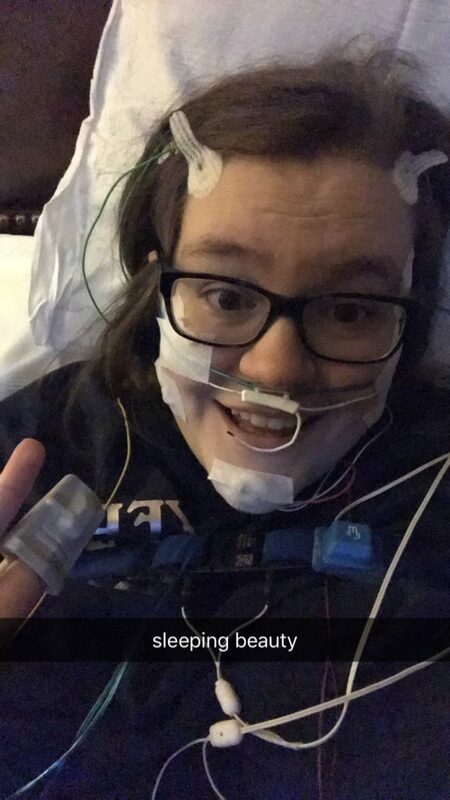 If a bunch of electrodes in my hair weren’t enough, they started putting them on my neck and my FACE (and using medical tape to tape them in place), they stuck EKG electrodes on my chest, electrodes on my legs, a microphone next to my mouth, a cannula in my nose, a strap around my chest, and GUYS I WAS FRANKENSTEIN’S MONSTER WITH A MILLION WIRES AND CABLES ATTACHED TO ME, COVERED IN GLUE AND TAPE, AND I WAS NOT HAPPY ABOUT ANY OF IT. And DON’T get me started on the pulse oximeter. Pulse oximeter? I think you mean, fun tiny meter on my finger for me to play with and make nurses and med techs angry when I won’t leave it alone. 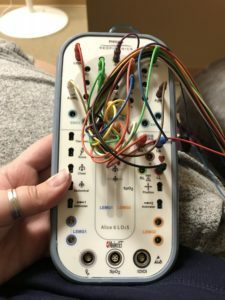 9:45 PM — The tech told me that the sleep study was supposed to be like any normal night for me. 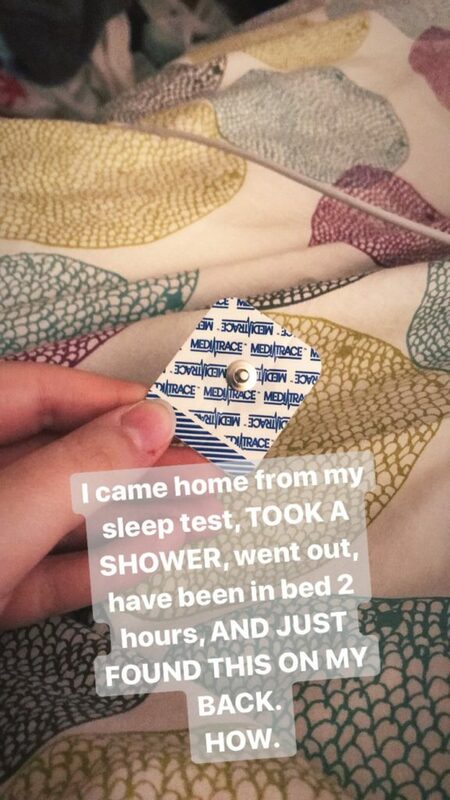 (I don’t think she was aware that a normal night for me consisted of bed time at 2 a.m., doctor’s orders.) She finished hooking me up for the sleep study, turned out the lights, and I was set for the night. I watched TV for a while and then decided to try and sleep. 10:30 PM — I turned on the TV—it was only 10:30, and I was wide awake. I watched an hour of TV and decided I was going to try to fall asleep. From 10:30 to 12:30, I was wide awake. I tried everything—I thought of things my therapist would say when I’d overthink things, I repeated “who cares when I fall asleep?” at least a hundred times, I thought of plots of stories I’d like to write one day, I thought of blog posts I should write… and time kept passing. I finally decided I needed to just clear my mind and I turned on the TV to clear my mind. 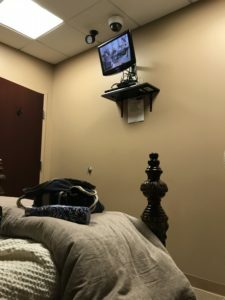 12:45 AM — After 15 minutes, the tech came in and said that because it was a sleep study, it was not time to watch television. If you ever want to feel like a child, just have someone say those words to you. You will feel RIDICULOUS. I tossed and turned for another hour or so. 8 AM — I was abruptly woken up. With no sunlight and with off-hours, it felt like the middle of the night. I went to the bathroom, which was awkward as I still had to manage carrying the panel that was attached to me via 20 something electrodes, came back, and a new tech started removing some (but not all) of the wires—because I’d be there all day for the nap study. I moved from the bed to the chair so I’d stay awake. I watched morning shows—something I haven’t done in ages. 9:30 AM — Nap #1. According to the doctor, I slept during this nap. I’d call her a liar, but she has scientific data that can prove me wrong. 10:00 AM — I watched a lot of Dr. Pimple Popper videos. I was really bored. 11:30 AM — Nap #2. The doctor said I also slept for a few minutes during this nap. I agree with her (and the medical equipment)’s assessments. 12 PM — I wasn’t given anything to eat for breakfast, and while they let me order lunch, there was a mix up and it never got ordered. (UGH.) I tried to distract myself and started sending out distress texts. No sunlight. No food. There were limited channels on the TV and the Internet wasn’t strong enough to stream Netflix. I was strictly forbidden from napping outside of my designated nap times. This was every millennial’s worst nightmare. 1:30 PM — Nap #3. My lunch from Domino’s had just arrived, but I was forbidden from eating until after the nap. At this point, the naps felt forced and more like a torture device. 2 PM — I ate my boneless chicken wings faster than I’ve ever eaten anything. Domino’s never tasted so good. I also found a stack of granola bars in the kitchenette next to the bathroom, I think they were supposed to offer me one that morning. I stole one, ate it like a bandit, and hid the wrapper in my backpack because I was afraid of getting caught. 3:30 PM — Nap #4. The routine was old. I laid there, tried to turn off my mind, desperate to sleep, but I was wide awake. I’ve never been so awake in my entire life, despite only sleeping four or five hours the night before. 4 PM — I started researching the outline of the Geneva Convention and started dreaming about going home and showering. 5:30 PM — MY FINAL NAP. I CAN DO THIS! One of the techs and I made small talk as she hooked me back up and fixed some wires. She asked me if I ever take naps on normal days. “Sometimes,” I said. “You shouldn’t take naps,” she said, and then she left me to take my nap. My dad was waiting for me in the lobby of the building and I nearly ran downstairs with all of my belongings to get outta there. I was done. I’m skeptical but optimistic—and ultimately just happy that the sleep study is over and hopefully I don’t have to get hooked up to that many wires ever again.